Imagine, for a moment, that you hold the lofty position of Inspector General for a major midwest US state. Imagine further that down the road and around the corner, before you time, way back in 2005 gross malfeasance and criminal activity happened in your state’s Bureau of Workers’ Compensation (BWC). And people went to jail. All told, there were nineteen criminal convictions, including several prominent Republican politicians. Your governor at the time, a member of the state’s most distinguished political family of the 20th century, a family that includes one member who became both President and Chief Justice of the US Supreme Court, pleaded “no-contest” to criminal charges of misdemeanor ethics violations. Your name is Randall Meyer, and you inherit this mess in Ohio. You inherit it, because nine years ago, a political lifetime in the past, your office was charged with investigating the whole thing and producing a report that would explain what happened, along with how and why, as well as what the state and Bureau have done to prevent such a sorry affair from ever happening again. The whole thing came about, because even farther back, in 1998, the BWC gave Thomas Noe, a major Republican fundraiser and professional coin dealer, $50 million to invest in rare coins, an investment with, essentially, no liquidity. And that is probably why no other state in the nation pursued such an investment with its workers comp surplus. The concept wasn’t complicated: Noe and his partners took the state’s $50 million and, applying their professional experience, bought rare coins, which they then tried to sell at a profit. Sound risky? In 1999, Keith Elliot, the BWC’s manager of internal audits, picked up the corner of the rare coin rug and tried to see what was growing underneath, because of “the unique nature of the investment.” He asked uncomfortable questions, was able to put a few minor controls in place and was essentially stonewalled by the Bureau’s leaders. The scandal was mothers milk to investigative journalists. As so often happens in these situations, the Blade grabbed hold and would not let go. It infuriated comfortable politicians and, in the process, performed huge public service for Ohio. For that service the Blade and its investigative journalism team won more than a dozen national, state and local awards, including being a Pulitzer Finalist for Public Service. We at the Insider also drank deeply of Coingate’s milk, writing about it numerous times. How could we not? But, back to you, Randall Meyer, Ohio Inspector General. Last week, you issued your office’s final report on Coingate – and, really, the only reason you released the redacted cat from the bag was because the Toledo Blade sued you to do it. One would think that a report coming nine years after the investigation began and six years after the last prosecution would be juicy, indeed. But such is not the case. Your report was a mere chronology of events, not much of an investigation. You report that, “As the task force investigation was completed prior to the current inspector general assuming this office, there were no resources utilized to reinvestigate an already completed matter.” So, the Report did not include any investigative records, such as witness interviews. You didn’t even interview Mr. Coingate, himself, Tom Noe. You did cause a bit of trouble for yourself, however, when you wrote in the Report that Noe’s ex-wife, Bernadette Restivo, was one of those against whom the BWC won civil judgements. The lady reacted strongly to that, and the day after you released the report, you had to change it to take her out of it. 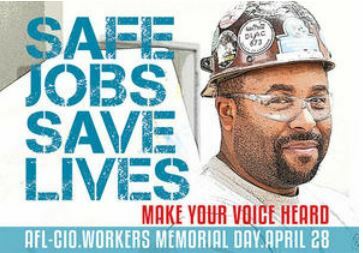 Workers Memorial Day – Because Going to Work Shouldn’t Be a Grave Mistake!! National Council for Occupational Safety and Health? Biweekly roundup of health wonkery – Louise Norris posts Ways the ACA Could Be Improved Edition of the Health Wonk Review at Colorado Health Insurance Insider, a robust roundup of links and opinions from some of the best health wonks on the web. It could also be titled the “hopeful signs of spring” edition – check out the great local photos. Reminder: April 28 – Workers Memorial Day is coming up. April 28 is dedicated to, remind us that every death, injury, or illness on the job represents a human tragedy. For a toolkit or list of events, see the AFL-CIO Workers Memorial Day site. Yesterday was the one-year anniversary of Bangladesh’s Rana Plaza factory which killed 1,129 garment workers. The New York Times looks at the past year’s battle for a safer Bangladesh. Terrorism backstop – As the renewal of terrorism insurance winds its way through the legislative process, the industry is fairly unified in reaffirmation of the importance of renewal. The current bill is slated for expiration on Dec, 31. A newly released 2014 Terrorism Risk Insurance Report by Marsh makes the case for renewal, stating that the law offers a stable underpinning to ensure availability and affordability of coverage. Last year’s Boston Marathon bombing sparked demand among smaller and midsized firms — and also raised the issue of a need for clarity about just what constitutes a terror event. CA Opioid Guidelines – Joe Paduda posts a detailed take on the strengths and weaknesses of California’s new Opioid Guidelines. His opinion? Underwhelming. Claims – Dave DePaolo has a post on Mental Claims & Boundaries, in which he looks at a PTSD claim that is being contested in Florida. Opioids– Lab-based Urine Drug Monitoring, Interventions Improve Outcomes for Injured Workers on Chronic Opioid Therapy – Clinical interventions performed in conjunction with laboratory quantitative drug testing and monitoring reduced injured workers utilization of high risk medications, according to a clinical study released by Progressive Medical/PMSI and Millennium Laboratories. The study showed a decrease in all measures of utilization, driven primarily by opioids (32%) and benzodiazepines (51%), as well as a 26% reduction in total utilization of all medications, regardless of drug class. 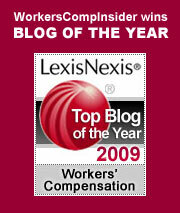 Could Telecommuting Be Deemed a “Reasonable Accommodation” Under the ADA? Do your neighbors have enough to eat? OSHA Quiz – Is a Dislocated Finger Closed Reduction Procedure Considered an OSHA Recordable? 30 Signs Made By People Who Don’t Know How To Use Quotation Marks. Check out the freshly posted Health Wonk Review – The April Fools’ Edition at Healthcare Lighthouse. Think we’re a little late on the date? Nope. Host Billy Wynne says the spirit of April Fools’ lives on as the blogosphere’s smartest health wonks gather to correct foolish notions and misconceptions floating around in certain pockets of our national dialogue. Billy has been contributing to Health Wonk Review for some time now but this is his first time at bat in hosting, so be sure to give him a a visit. While you are visiting this edition, take a minute to explore other resources at Healthcare Lighthouse beyond the blog. Billy is the CEO and founder – he has gathered an impressive advisory board. The U.S. Food and Drug Administration (FDA) has acknowledged that prescription drug overdoses are now the leading cause of injury-related death in America, surpassing auto accidents. Couple that with the Agency’s approval last October of Zohydro ER, the first pure opiate painkiller, and you begin to understand why many lawmakers are left scratching their heads. More than half the states’ attorneys general have asked the FDA to withdraw approval of the drug. But the Agency is unrepentant. FDA Commissioner Margaret Hamburg told the Senate that the drug is a safe and effective option for patients with excruciating pain. In late March, a stymied Governor Deval Patrick took the highly unusual step of banning the sale in Massachusetts of the controversial opioid made by California-based Zogenix, Inc. Many in the Massachusetts legislature as well as a number of workers compensation claims professionals thought it was the best thing any governor had ever done, a bold step to protect the citizenry. According to Patrick, his issue with Zohydro ER is that it is not in “an abuse-resistant form,” meaning that it is not crush-resistant. Consequently, addicts (or anyone else who has the drug, for that matter,) can crush it and snort it or inject it. Why would anyone want to do that instead of simply washing it down with a sip of water? Because in its pill form Zohydro ER is an “extended release” medication. That’s what the ER stands for. In fact, Zohydro’s full legal name is Zohydro ER (hydrocodone bitartrate) Extended Release Capsules. Crushing and snorting or injecting simply bazookas the whole dose at one time, which can be a deadly proposition. Zogenix’s President, Steven J. Farr, attended yesterday’s hearing and, afterwards, took pains to let everyone know that Zohydro ER is safer than other hydrocodone drugs because it does not contain Acetaminophen, which can cause liver damage and failure with prolonged, high-dose usage. Farr did not mention that Zohydro ER contains up to five times the hydrocodone found in Vicodin. He did say that the company is in early stage development of abuse-deterrent formulations of the drug. That gave cold comfort to the Governor. First, it is not the fault of Zogenix that we have an opioid epidemic in Massachusetts or anywhere else. Yes, there’s an epidemic, but drug makers didn’t cause it. Irresponsible physicians, doctors who consider the Hippocratic Oath to be a mere suggestion, have placed their patients on the slippery slope to hell by prescribing over and over again strong and addictive narcotics for conditions for which those narcotics were never intended. Second, the vast majority of physicians would never knowingly over-prescribe any medication. They have not forgotten that Oath and why they went to medical school. The ones I know resent and cannot understand the over-prescribers. Third, although I wish it had built crush-resistance into Zohydro ER from the beginning, Zogenix did nothing wrong here. In fact, the Zogenix complaint notes: “When FDA approved Zohydro, it considered but rejected the idea of requiring the drug to utilize abuse-deterrent technology.” The company did everything it was supposed to do in gaining FDA approval. And that isn’t easy. One of the more difficult tasks in the universe is to get FDA approval for a new drug. The camel through the eye of the needle doesn’t even begin to describe the process. It takes many years and boatloads of money. So, you can understand that after all those years and money devoted to bringing this drug to market, to have it summarily banned is a bit hard to take. Fourth, there are many people who suffer with agonizing pain. Think end-stage cancer. Those human beings need and deserve the best pain amelioration they can get, and the goal of the pharmaceutical industry, in addition to making money, is to give them that relief. Finally, ending the opioid epidemic will require political courage and a much more highly-regulated process to oversee and assure that the relatively few ethically-challenged, weak-kneed and overly greedy physicians who now abuse their privilege are forced to change their bad behavior and follow that “do no harm” rule. If it weren’t for them, there would be no epidemic.